Faceless and almost formless, these figures are representative of a recent tendency in crèche culture. The tendency is termed "narrative simplicity," and calls for simple and natural materials to embody and represent the Christmas story. In this set, the material is wool, nothing but bits and pieces of pure and dyed wool. But wool adds a secondary, a moral significance to the story told by these woolen figures. The word "wool" in German is at the heart of a number of proverbs expressing rage, quarrelling, getting in each other's hair, being at loggerheads with somebody. Thus, wool is a reminder that the message of Christmas is a message of peace and not of quarrelling. A dyed-in-the wool Christian is a lover of peace. 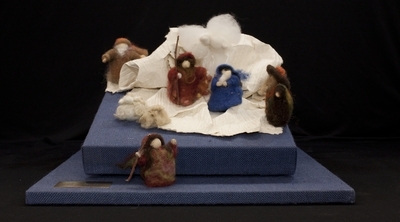 Nativity set created by Katrin Barendregt in Switzerland from dyed wool. The date of creation is unknown. Exhibition label originally written by Fr. Johann G. Roten, S.M. for exhibit entitled "At The Manger" and held at Roesch Library, University of Dayton.